Holosonics' Founder and CEO, Dr. F. Joseph Pompei, was recently invited to speak in Budapest, Hungary at the Euro Air Transport IT Summit to discuss the benefits of implementing directional sound technology in airports. Dr. Pompei's demonstration of Audio Spotlight at the event was a revelation to many attendees, who were astounded as they heard audio clearly when a speaker was pointed at them, and then quickly heard nothing as soon as the beam was pointed away. During the summit, Dr. Pompei demonstrated Audio Spotlight's unique audio technology that provides control of sound to the same degree of control as light. Audio Spotlight has a proven track record of limiting extraneous noise in a wide range of settings, including the world's busiest airport, Atlanta's Hartsfield-Jackson International Airport, as well as Miami International Airport, Heathrow Airport, and many others. In his presentation, Dr. Pompei discussed the range of uses that Audio Spotlight can serve in airport terminals, common areas, and security checkpoints. Airport security, as most travelers know, can be one the least enjoyable aspects of air travel, given the long wait in line that often occurs when passing through security. With Audio Spotlight technology, the messages being aired that pertain only to security can be focused solely and personally on passengers who are in the security line. Dr. Pompei showed that by concentrating security-specific audio to one area, Audio Spotlight enhances the experience for everyone in adjacent sections of the airport by eliminating unnecessary background noise. Other airport areas where audio instructions are required for safety include automated warnings that are announced at the start and end of escalators and moving walkways. In order to limit injuries that can occur when people use these conveyances, a spoken alert tells the user that they are at the start or end of an escalator or moving walkway. In his summit presentation, Dr. Pompei revealed how Audio Spotlight is the most effective technology available to deliver these warnings without creating sound bleed into a wider area. The presentation at the summit also showed Audio Spotlight's use as the perfect complement to one of air travel's more recent technological enhancements - automated ticketing kiosks. 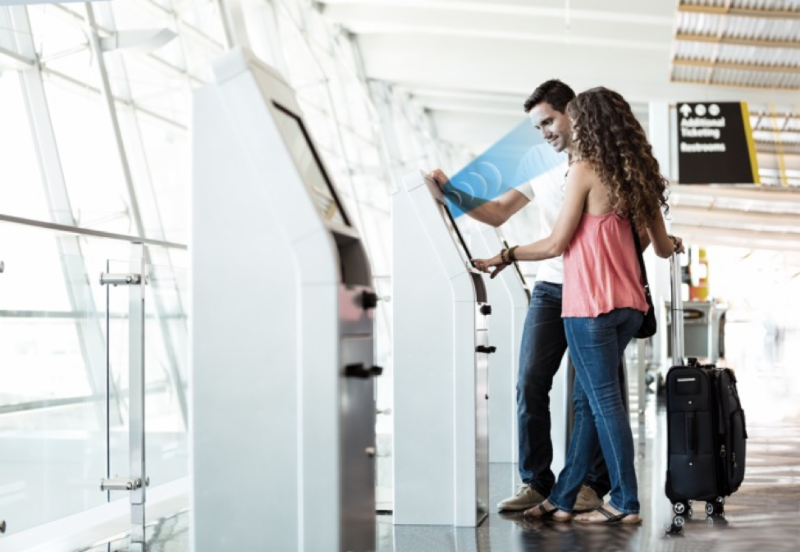 Directional sound at ticket kiosks not only limits the sound to the person printing out a boarding pass, it also maintains the user's privacy and complies with requirements to meet the needs of people who are visually impaired. Contact us today to learn more about how our directional sound technology can benefit your projects in the same way it has enhanced audio communications systems in airports and a wide variety of other settings that include museums, libraries, exhibits, and retailers.